The National Crime Agency (NCA) was immediately dubbed the “British FBI” when it was founded in 2013. Given the media firestorm it finds itself in this film, the comparison seems particularly apt. A plundered pension mega-fund threatens to undermine the entire financial system and nobody at the NCA has a clue where the missing 700 million pounds might be, except maybe their newest, most unlikely recruit in director-screenwriter-editor-cinematographer-score composer Thomas Lawes’ overachieving Monochrome (trailer here), which releases today on VOD. Gabriel Lenard thinks differently. He has synesthesia, which gives him a savant-like ability to perceive patterns and remember numbers. For a while, he had a regular job, but his shyness and OCD-ish behavior forced him to return to his mum’s flat. NCA’s chief head-shrinker Dr. Randall Grey believes in him, so he will be his direct supervising agent. Currently, the pension fund case is the agency’s primary concern. They arrested an obviously guilty City embezzler, but his girlfriend Emma Rose slipped through the dragnet. Despite her affair with the accused, Rose has always has a hippy contempt for money, so she has no problem going off the grid. However, only Lenard picks up on evidence that she has also turned into a serial killer, preying on the wealthy home owners, whom she offers herself up to as exploitable house-help. For the most part, Monochrome is a rather crafty procedural, featuring some interesting characters. It is particularly inventive when it presents a stylized rendering of the colorful way Lenard perceives the world, so it is rather odd Lawes does not do so more frequently. Even more importantly, the collegial relationship that develops between Lenard and Grey gives the film a strong core. Unfortunately, the resolution falls somewhat flat, but that happens all the time. Cosmo Jarvis is quite compelling as Lenard, conveying all his awkwardness, without ever relying on easy shtick. Accomplished stage actor Patrice Naiambana also makes quite an impression as Dr. Grey. He speaks with commanding authority, while projecting compassion and empathy. Lee Boardman is suitably slimy as Lenard’s NCA nemesis and James Cosmo gorges on the scenery playing Rose’s first victim, past-his-prime celebrity artist Roger Daniels. Unfortunately, Jo Woodcock’s vanilla Rose rather fades into the background, which is a serious drawback. There are multiple speaking-in-retrospect voice-overs throughout Monochrome, but believe it or not, they all sort of work. It is not the be-all-end-all, but we would be happy to see this NCA team tackle another case—and that’s saying something. 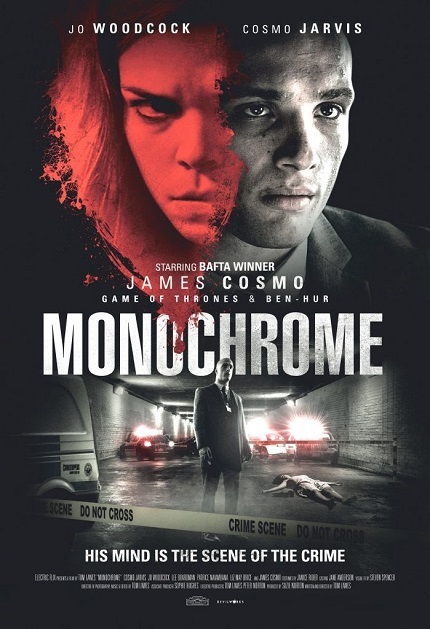 Recommended for fans of British procedurals, Monochrome is now available on VOD platforms, including iTunes.